The flag will be hoisted on January 26 in a school on the outskirts of Palakkad in Kerala, RSS members said. New Delhi: Undeterred by an ugly spat over the unfurling of the national flag in Kerala on August 15, RSS chief Mohan Bhagwat is all set to hoist the tricolour again in the left-ruled state on Republic Day. 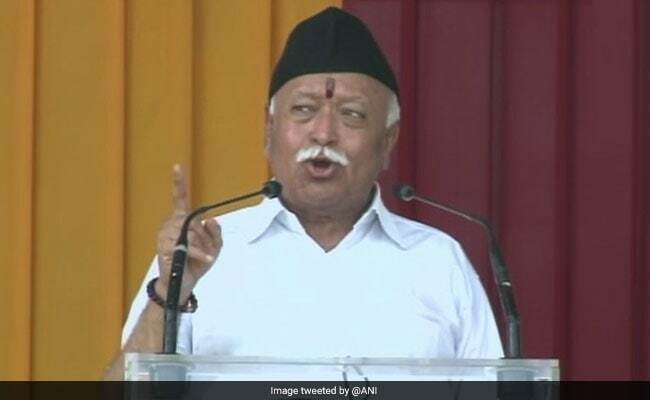 Mr Bhagwat will be in Kerala to attend a three-day camp of the Rashtriya Swayamsevak Sangh (RSS), starting January 26, to be held in a school near Palakkad town. "The sarsanghchalakji (RSS chief) always hoists the national flag on Independence Day and Republic Day wherever he is on these days. Since on January 26 he will be in Kerala, he will hoist the flag there. It should only be seen in this light," a senior Sangh functionary said. Sangh members added that the school where the RSS event is being organised is under the administration of the RSS's Bharatheeya Vidya Nikethan. A functionary said the RSS was a nationalist organisation and celebrating these national days was a part of its culture. On August 15 last year, Mr Bhagwat had unfurled the tricolour at a school in Palakkad district, flouting an order of the district administration. "It was very unfortunate that last year the state government ordered the school not to allow him to hoist the flag," the functionary said. The RSS has a considerable presence in Kerala, where the BJP is seeking to make inroads. The state has been witnessing incidents of political violence involving cadres of the ruling Communist Party of India - Marxist (CPI-M) and the RSS.